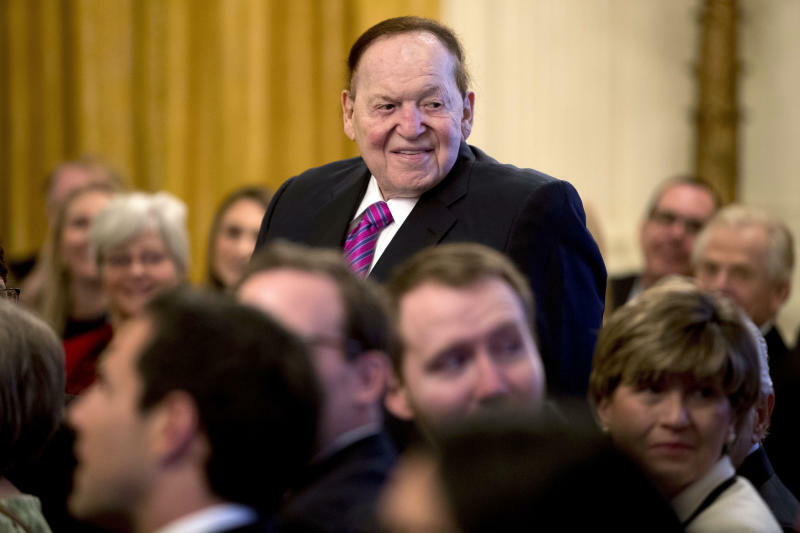 LAS VEGAS (AP) — Casino magnate and major GOP donor Sheldon Adelson is battling cancer, but industry analysts and his Las Vegas Sands Corp. on Friday said the gambling empire he founded and helms has the personnel to guide it through the health crisis. Their comments came a day after the company revealed Adelson is receiving treatment for non-Hodgkin's lymphoma. He has not been at the company's offices in Las Vegas since around Christmas Day. Las Vegas Sands "has one of, if not the, deepest benches amongst the destination regional operators, in our view," analysts with Stifel said in a research note Friday. They added that they "believe the company remains in incredibly good hands." Thursday's announcement about Adelson's condition followed comments by a Sands attorney in a court hearing earlier in the week describing the billionaire's health as "dire." The company said side effects from medication have restricted him from traveling or keeping regular office hours, but not from fulfilling his duties as chairman and CEO. It is unclear what treatment Adelson, 85, is receiving. Treatment for non-Hodgkin's lymphoma can include chemotherapy, radiation therapy and bone marrow transplant. The Securities and Exchange Commission does not require companies to disclose the health issues of executives. The company on Friday told The Associated Press it is doing everything required of a publicly traded company. "Mr. Adelson himself has said for many years he does not run the day-to-day operations," Las Vegas Sands spokesman Ron Reese said, adding that those responsibilities fall to the company's president and chief operating officer, Robert Goldstein, and Patrick Dumont, its executive vice president and chief financial officer. Adelson is seen as the company's chief visionary and strategist, Reese said. Goldstein and Dumont, who is also Adelson's son-in-law, met with the casino mogul as recently as Friday, Reese said. Sands' stock dipped about 1.7 percent in moderate trading Friday. Most corporate governance experts believe CEOs have a right to privacy, particularly with respects to their health. But some say that coming forward would help end the stigma on workplace illness for other executives and workers. Top executives also must consider their roles as corporate officers when evaluating what personal information they disclose — first to their boards, then to their workers and the wider investing community. Adelson is Las Vegas Sands' largest shareholder and regularly participates in the company's earnings calls, but was absent when it reported results on Jan. 23. Goldstein said at the time that Adelson was "a little bit under the weather." Adelson is one the nation's most influential GOP donors, hosting the party's most ambitious candidates at his office on the Las Vegas Strip. The billionaire and his wife, Miriam, gave President Donald Trump's campaign $30 million in 2016. They followed that by contributing $100 million to the Republican Party for the 2018 midterm elections. He was photographed in mid-November at the White House, when Trump recognized Miriam Adelson and other Americans with the Presidential Medal of Freedom, the highest honor the nation reserves for a civilian. He was expected to testify later this year in a civil case in Las Vegas brought by Hong Kong businessman Richard Suen and his company, Round Square Co. He testified in 2013 and 2008 in the case's two previous trials. The judge in the case ruled Friday that Adelson does not have to testify in court or sit for a deposition. Macau now powers the profits of three of the four largest American casino operators, including Sands. Adelson's company and others will soon be vying for licenses to operate casinos in Japan.